On November 5, 2017, Hewa took his oath as a US citizen. It was a proud moment which was not without hardships or sacrifices. He’d arrived in Harrisonburg nearly eight years prior, joining 18 family members--and like himself, many of them were unable to communicate in English. His dedication to create a better life for his family resulted in changing more than their lives--his tutor, John, will forever be positively affected by the experience. “John said, ‘I'll teach you,’” Hewa said with a beaming smile. “He helped me for two hours every Monday and Thursday.” John and Hewa met regularly for a year. It was a learning process for both of them. John learned to trust his instincts and not second-guess himself; Hewa learned about reading and writing. John, a JMU graduate and a rec instructor for Harrisonburg Parks and Recreation, became a Skyline Literacy tutor because he wanted to “pay it forward.” His parents immigrated to the United States in 1979, and his family will always be grateful for the help and guidance they received during that time. Although John’s initial goal was to help others the way his family was once helped, the experience taught him more than he thought was possible. “I'm introverted in nature. I'm working on my confidence, comfort in interacting. Elevating myself. Skyline has given me a chance to get out of my comfort zone and grow,” John said. They utilized Skyline Literacy’s various learning resources, including flashcards and textbooks, in order to tackle silent vowels, consonants, pronunciation and sentence structure. For an native English speaker, these subjects are a thoughtlessly apart of everyday life, however, to a non-English speaking adult, everyday occurrences can be overwhelming. “Hewa is humble. He’s one of the most polite and friendly people I’ve ever met. He understands how much he can do. The language is not a barrier for him. His hard work sped [the process] up,” John said. Throughout the process, he found that encouragement and, simply, showing up were the most impactful requirements as a tutor. The lessons and teaching were a natural part of the process as they worked toward Hewa’s goals. "No matter whether you are older or younger, Skyline can teach you," Hewa said. “Hewa taught me a lot. You have to work at anything you want to be successful in,” John said. “Hewa has many goals,” John said, as he placed his arm around him. Although, in the beginning, a main goal was for Hewa to obtain citizenship, taking his oath hasn’t slowed down his goal of continuously learning. “Take learning for all its worth. Information becoming more and more important,” John said. Through his own family’s experiences, John was aware of the dedication it takes to enter into a new community and a new culture. 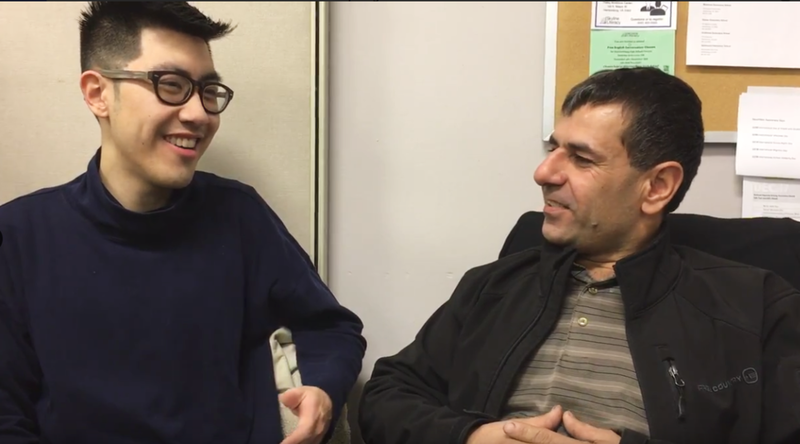 Through becoming a tutor at Skyline Literacy, he learned that helping another develop their voice through a new language also assisted him in finding his voice as a more confident individual. The road to success in a demanding, ever-changing world is one down which we have all journeyed. Trying to walk that road when you struggle daily with a limited knowledge of the language around you is an all-together different (and much more rigorous) challenge. It is a challenge that all of our Learners know, from navigating the Web in search of employment to communicating basic needs to medical physicians to helping their children with homework. Here at Skyline, we believe in working with our Learners so that they achieve a better tomorrow for both themselves and their families. We believe in every person’s ability to learn and grow, regardless of history or circumstance. We believe in you. Here is a video featuring four of our Learners: Anay, Yuri, Andy, and Brittany. They all came from different places and different backgrounds; they all sought to learn English and improve their literacy skills to better their lives and the lives of their families; and, with Skyline’s help, they all worked hard and overcame the various obstacles associated with these challenges to reach their goals. Below is a 2015 video showcasing various learners, tutors and volunteers! This is the first in a new series of interviews intended to highlight and recognize the invaluable work performed by our volunteer tutors in helping others develop and achieve literacy, the foundation for everything else they may choose to do in life. This month we highlight Josie Kinkade, who has been a volunteer tutor for about a year. Although Josie has never been a teacher nor received any formal teacher training, she says that she has always loved to teach and feels that by tutoring she is, in a way, following in her mother’s footsteps, since her mother also loved to teach-- “had a knack for it”--although she also had no formal teacher training. Josie suggests that she had an unusual upbringing. She was born in Seattle, but after her parents separated, her mother moved with Josie to Mexico City, because of the lower cost of living. As a child, Josie lived in Mexico for five years while her mother taught English as a Second Language in a school. Growing up, Josie dreamed of becoming a doctor, but with limited means and expectations, she did not believe she could attend medical school. She did not complete high school, so she had no diploma and no money, but she loved to read fiction and would read two to three books a week. “It was escape and entertainment. I liked to go to the land of books.” Fortunately, someone encouraged not to give up and to pursue her dreams, which she did. She earned her GED and then, went on to graduate from medical school. Josie practiced family medicine “over the mountain” in Louisa for 15 years. During that time her long-standing interest in animals and animal welfare grew. Eventually, she retired from medicine in order to work full-time on these issues and became executive director of Cats’ Cradle in Harrisonburg, a position she held for five years. When she retired from that position, she began a search for new experiences as a volunteer. When she contacted Skyline Literacy, she was invited to attend an upcoming tutor training session. About the training session, she remarked, “It is great that they train you and give you a job.” She started by tutoring, one-on- one, two students who needed help to pass the U.S. citizenship exam. Smiling broadly, she revealed that both students passed. She is currently doing one-on- one tutoring of English as a Second Language with a woman “who has two kids and works six days a week.” Josie’s “learner” goes to work directly from their tutoring sessions. Her “learner” tells Josie that she wants to learn English to communicate better with her customers and to advance in her career goals.